1. Ingvar wants to scale the wall of an Irish monastery. The wall is 20 feet high, and right in front of the wall is a moat 15 feet wide. How tall must Ingvar’s ladder be in order to reach the top of the wall? 2. Thorgils can burn 20 English huts each hour. Hastein can burn 35 English huts each hour. Working together (albeit on opposite sides of the village), how long will it take them to burn all 385 huts? 3. Siggurd is in a blood feud with Ottar. Ottar is also in another blood feud with Illugi. 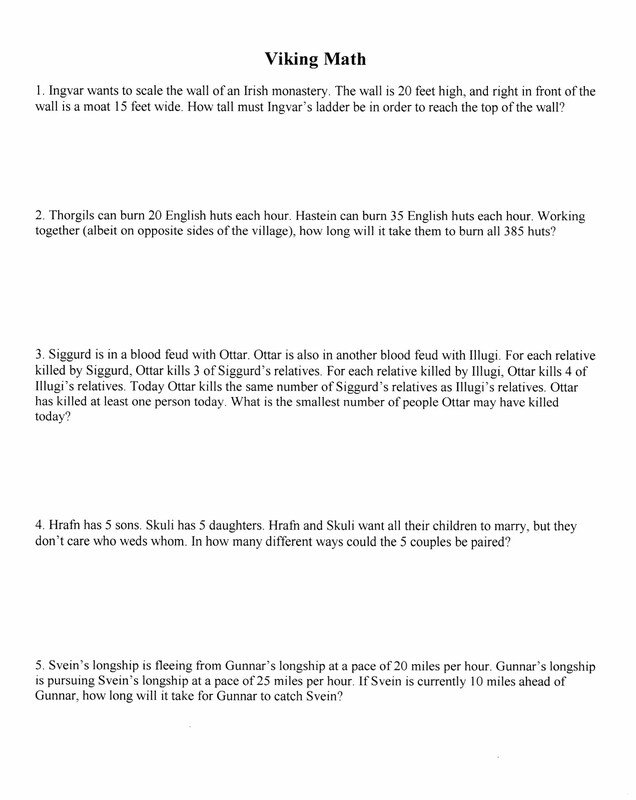 For each relative killed by Siggurd, Ottar kills 3 of Siggurd’s relatives. For each relative killed by Illugi, Ottar kills 4 of Illugi’s relatives. 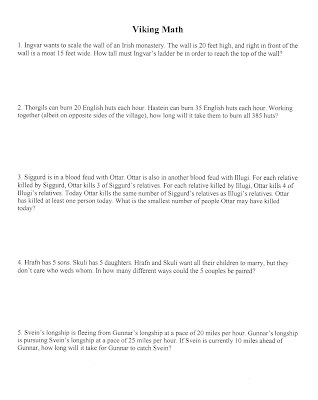 Today Ottar kills the same number of Siggurd’s relatives as Illugi’s relatives. Ottar has killed at least one person today. Siggurd and Illugi do not have any relatives in common. What is the smallest number of people Ottar may have killed today? 4. Hrafn has 5 sons. Skuli has 5 daughters. Hrafn and Skuli want all their children to marry, but they don’t care who weds whom. In how many different ways could the 5 couples be paired? 5. Svein’s longship is fleeing from Gunnar’s longship at a pace of 20 miles per hour. Gunnar’s longship is pursuing Svein’s longship at a pace of 25 miles per hour. If Svein is currently 10 miles ahead of Gunnar, how long will it take for Gunnar to catch Svein?